FREE FLOW drinks for Ladies from 9.30pm - Midnight! Tickets start at only $22/pp - INSANE DEAL! It's gonna be a special COMEDY & LADIES NIGHT at 360 Lounge, Singapore's newest and swankiest lounge bar in the CBD. 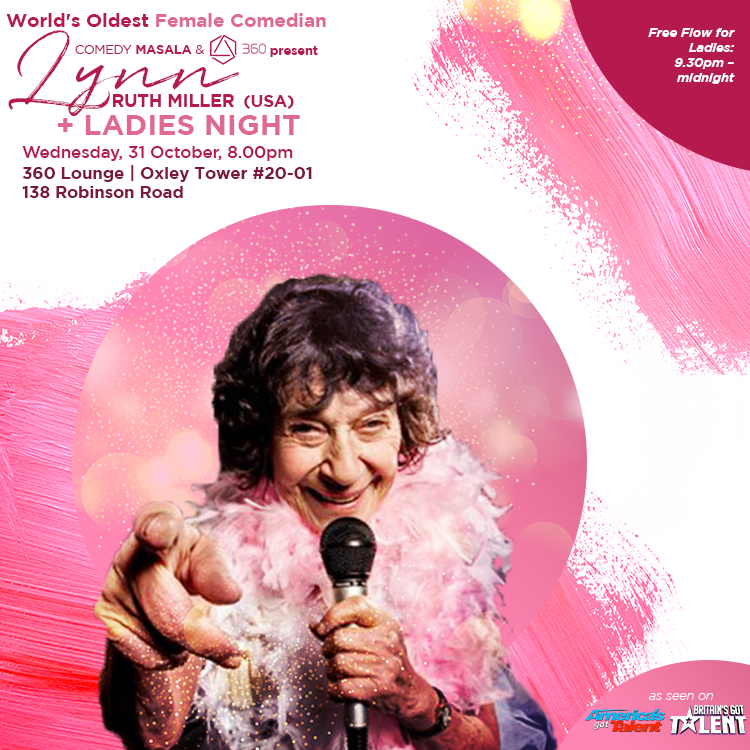 First we've got LYNN RUTH MILLER, World's Oldest Performing Female Standup Comedian (she's 86yo! ), performing a hilarious comedy routine, and then it's time to PARTY with FREE FLOW for the Ladies from 9.30pm - Midnight (Guys - don't worry, there are special promos avail at the bar!). So book tickets starting at only $22pp and get ready for COMEDY, FREE FLOW & AWESOME MUSIC! LYNN RUTH MILLER started doing comedy on stage when she was 71 years old. She was dubbed the new Joan Rivers of Fringe Comedy at The Edinburgh International Fringe. Now 86, she made top 4 comedians in America’s Got Talent, 2008, Won People’s Choice in 2009, Branson Comedy Festival, the finals in Bill Word’s Funniest Female Contest 2009 and semi-finals in the SF International Comedy Competition and Star of the Brighton Fringe Festival in 2009. She has been performing at the Edinburgh Fringe Festival since 2005. She is a regular at the SF Punchline and The Stand in Scotland and made the top 100 in the UK in Britain’s Got Talent. She won the TO&ST AWARD 2014 in Edinburgh for best Cabaret Edinburgh Fringe, 2015 Liberty Award, Leicester Comedy Festival; 2015 finalist Old Comedian of 2015; London.